IT Solutions for Businesses with 5 to 75 Employees. For nearly 30 years, our clients stick with us because they want to. Since 1988, The IT Foundry offers value. Strategic value in terms of planning and execution. Practical value in terms of ROI and flexible billing arrangements. The result: The IT Foundry enjoys a close, personal relationship with some of UK’s most productive and meaningful enterprises. The IT Foundry adds both strategic and practical value to your businesses IT systems. For owners of companies with 5 to 75 employees, The IT Foundry is the friendly and helpful IT company which brings flexible billing and a satisfaction guarantee to your business. Your IT systems will be stable, innovative, and will earn its keep. Call or email to learn how we deliver IT stability, modernisation, and affordability so you can focus on the business. "The IT Foundry has supported BIC UK Ltd for many years, working closely with our remote IT team to resolve local technical problems, great job." "On a relatively frequent basis we have companies contacting us to enquire about our IT. The answer is always the same. We have a company (The IT Foundry) who we have worked with for over 20 years; we have no intention of changing." "The IT Foundry has been our technology consultants and support since 2002 including acting as key coordinator to an Office move in 2011. We have found the broad depth of their knowledge in hardware, software and networking able to satisfy all our needs and create a robust infrastructure with understanding of the unique requirements of a financial services firm on which we have been able to build our business." "We view The IT Foundry as part of our team. They are technically competent, extremely thorough and easy to work with. As a company with limited I.T knowledge we’ve utilised their services for the last 15 years, the value they bring to our business was exemplified during the recent replacement and upgrading of our entire system which passed without a hitch due to their meticulous planning." "The IT Foundry are an actual lifesaver. Hugely valued, incredibly appreciated, outstanding service. 100% recommended." "The IT Foundry has worked with us for a number of years and has proved extremely reliable and flexible in that time. I would have no hesitation in recommending him to other clients." "The IT Foundry have been our IT support partner from start-up to multi-site organisation over the past 12 years. From remote support and set up of new users, through to advising us on our technology strategy to enable our growth, Disaster Recovery & Business Continuity Planning, whilst at the same time always cognoscente of our commercial constraints and provide solutions that align perfectly to our business. I would have no hesitation in recommending Mike and his team." "The IT Foundry are exactly what you want from IT support. Friendly, responsive and customer focused. With a sound strategic view and the ability to solve problems quickly, they are an extension of our team." "The IT Foundry have helped keep our IT infrastructure running 365 days a year for the past 15 years. During this time, we have migrated to newer technologies that have helped our organisation grow and evolve. The advice given has always been impartial, tailored to meet the needs of our business rather than serve themselves. 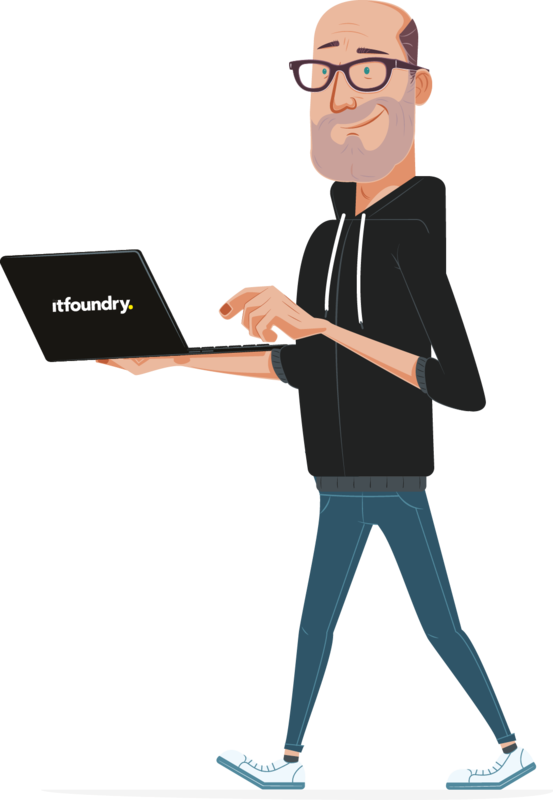 The IT Foundry support every aspect of our IT from individual user issues to disaster recovery."